This product is intended for use by physicians who are experienced in the administration of allergenic extracts and the emergency care of anaphylaxis, or for use under the guidance of an allergy specialist. Patients should be instructed to recognize adverse reaction symptoms and cautioned to contact physiciansâ€™ office if reaction symptoms occur. As with all allergenic extracts, severe systemic reactions may occur. In certain individuals these life threatening reactions may be fatal. Patients should be observed for at least 20 to 30 minutes following treatment and emergency measures as well as personnel trained in their use should be immediately available in the event of a life threatening reaction. Serious adverse reactions can be reported to the US Food and Drug Administration MedWatch, 5600 Fishers Lane, Rockville, Maryland 20852-9787, (800) FDA-1088, or www.fda/gov/medwatch. This product should not be injected intravenously. Patients who are taking non-selective beta blockers may be more reactive to allergens given for testing and may be unresponsive to the usual doses of epinephrine used to treat allergic reactions. Refer to the Warnings, Precautions, Adverse Reactions and Dosage sections below. Therapeutic extracts (concentrates) are designed primarily for the physician equipped to prepare dilutions and mixtures as necessary. Allergenic Extracts are manufactured from various biological allergenic source materials including pollens, molds, epidermals, insects, food and environmental inhalants. The extraction is performed in a glycerin solution and the resulting concentration is expressed as weight to volume (w/v) ratio. This is the weight of dry pollen in grams to volume of glycerin extracting solution in milliliters. Extracts are filtered and sterile filled. Tests include those for safety and sterility. The route of administration is subcutaneous. Scratch diagnostic extracts are of the same therapeutic extract formulation and their route of administration is percutaneous. Intradermal diagnostic extracts are dilutions of the therapeutic extracts using Sterile Diluent for Allergenic Extract. Water for Injection, USP q.s. Normal Serum Albumin (Human), 0.03% w/v Water for Injection, USP, q.s. Air replaced with Nitrogen, NF Water for Injection, USP q.s. The strength of Standardized Short Ragweed and Ragweed Mix, Giant and Short extracts is described (in addition to w/v) as antigen E content. The concentration of antigen E per milliliter of the final preparation as determined by radial immunodiffusion (RID). The antigen E content of an extract is influenced by several variables. These include antigen E content of the pollen, nature of extracting solutions, ratio of pollen weight to volume of extracting solution and storage conditions. Variables which influence antigen E stability during storage conditions include nature of the solvent, antigen E concentration and storage temperature. Glycerin is a stabilizer of antigen E and other allergens. Allergenic extracts for diagnostic testing produce erythema or erythema and wheal reactions in patients with significant IgE-mediated sensitivity to the relevant allergen. This allergic inflammatory response, although not completely understood, is thought to begin with the reaction of antigen with IgE on the surface of basofils, or mast cells, which initiates a series of biochemical events resulting in the production of histamine and other mediators. These, in turn, produce the immediate-type â€œwheal and flareâ€ skin reaction. The more mediator released, the larger the reaction. Because of a variety of factors, including the types of allergen extracts, delayed skin reactions can occur and usually disappear within a couple of days. The type of extract, size of the reaction and timing of the reaction are all factors used in determining a patientâ€™s sensitivity to an allergen. Allergen immunotherapy (also known as desensitization, hyposensitization, allergy vaccination, or allergy shots) involves treating a patient with increasing dosage of the allergens to which he is allergic, eventually reaching a dose plateau whereas the patient experiences an increased tolerance upon re-exposure to the allergens. The patient may or may not need to receive continued treatment to demonstrate the desensitization. The exact mechanisms of reaction of desensitization with allergens, which involve the allergen, IgE and IgG antibodies, mast cells and basophils and possibly other mediators, are not completely understood. However, efficacy has been shown in numerous well-controlled studies using specific common allergens. The goals of allergen immunotherapy are to decrease the production of IgE antibodies, initiate the production of IgG antibodies and stabilize mast cells and basophils. Overproduction of IgE in response to an allergen can induce other cells, particularly mast cells and basophils, to initiate a complex chain reaction that results in allergy symptoms. Numerous IgE receptor sites are located on mast cells as well as basophil cells. These cells are among the first cells to be encountered by the antigen. They contain potent chemical mediators (histamine and leukotriene, for example) of inflammation that are released when IgE and a specific allergen cross-link on the cell surface. The release of the chemical mediators results in inflammation and allergy symptoms. As a response to immunotherapy, the production of IgG is believed to work by blocking IgE from binding to mast cells and basophils. Thus IgG, the blocking antibody, may prevent the release of chemical mediators that produce allergy symptoms. Immunotherapy using allergenic extracts is indicated for use in patients with severe allergy symptoms (hay fever, rhinitis, etc.) to pollens, molds, insects, animal danders and various other allergens. Immunotherapy is intended for patients whose symptoms are not satisfactorily controlled by avoidance of the offending allergen or by the use of symptomatic medications. Treatment uses only those specific allergens that the patient is sensitive to based on diagnostic tests and medical history. It is not intended for treatment of patients who do not manifest immediate hypersensitivity reactions to the allergenic extract following skin testing. There are no known absolute contraindications to diagnostic testing or hyposensitization with allergen immunotherapy. Patients with cardiovascular disease or pulmonary disease such as symptomatic asthma, and/or who are receiving cardiovascular drugs such as beta blockers, may be at higher risk for severe adverse reactions. These patients may also be more refractory to the normal anaphylaxis treatment regimen. Immunotherapy is not generally indicated when the offending allergen(s) can be effectively eliminated or minimized by environmental control. There are differences of opinion on the possibility of routine immunizations exacerbating autoimmune diseases. The evidence has been inconclusive. Therefore, caution should be exercised in administering immunotherapy to patients with other immunologic diseases and only administered if the risk from exposure to the allergen is greater than the risk of exacerbating the underlying disorder. Injections should be avoided in patients with a bleeding tendency. See boxed WARNINGS at the beginning of this information sheet. Do not administer allergenic extract injections intravenously. Patients should always be observed for at least 20 to 30 minutes after any skin test or injection. Concentrated allergenic extracts should be diluted with Sterile Diluent for Allergenic Extract prior to use for intradermal testing and for immunotherapy preparation. Systemic reactions may occur infrequently and may range from mild exaggeration of the patientâ€™s allergic symptoms to urticaria, rhinitis, conjunctivitis, angioedema, cough, wheezing, fainting, pallor, bradycardia, hypotension, or even, in extremely sensitive individuals, to anaphylactic shock and death. Have epinephrine 1:1,000 readily available in case of a reaction. Emergency measures and personnel trained for medical emergencies should be immediately available in the event of a life-threatening reaction. Patients with unstable asthma or steroid dependent asthmatics and patients with underlying cardiovascular disease are at greater risk. Patients taking beta-blocker medication may not respond to the usual dose of epinephrine. Diagnostic testing as well as immunotherapy should be temporarily withheld from patients or the dose reduced until cause of reaction is evaluated by prescribing physician if any of the following conditions exist: (1) severe symptoms of rhinitis and/or asthma, (2) infection or flu accompanied by fever, (3) exposure to excessive amounts of clinically relevant allergen prior to a scheduled injection, and (4) systemic reaction to previous injection. The presence of asthmatic signs and symptoms may be an indicator of severe reaction following allergen injections. Any evidence of a local or generalized reaction requires a dose reduction during the initial stages of immunotherapy, as well as during maintenance therapy. Patient reactions to previous injections should be reviewed before each new injection and a conservative dosage schedule should be followed until a pattern of local responses is established which can be used to monitor increases in dosage. Patients should be observed in the office for at least 20 to 30 minutes after each treatment injection and instructed to seek medical attention if symptoms of a systemic reaction occur. Most severe reactions will occur within this time period, and rapid treatment measures should be initiated (see ADVERSE REACTIONS). In rare circumstances, a patient may have systemic reactions to minute doses of antigen and does not demonstrate increasing tolerance to injections after several months of treatment. If systemic reactions or excessive local responses occur persistently at very small doses, efforts at immunotherapy should be stopped. When changing lots of extracts, even though the formulation may be the same, the first dose should not exceed 50% of the previous dose as the extract may have lost potency over time and a fresh extract could have an effective potency that is substantially greater than that of the old extract. 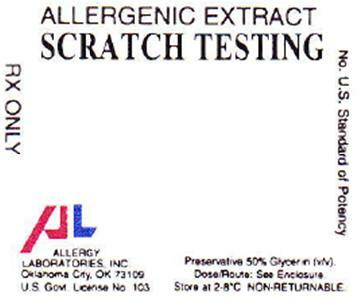 Aseptic technique should always be used when injections of allergenic extracts are administered. Patients should be instructed to remain in the office for 20 to 30 minutes after each injection to monitor for adverse reactions. Patients should be instructed to describe any active allergic symptoms such as rhinitis, wheezing, dyspnea, etc. prior to injection including any late reactions from previous administration. Beta-Blockers: Patients who are taking non-selective beta blockers may be more reactive to allergens given for testing and may be unresponsive to the usual doses of epinephrine used to treat allergic reactions. Patients with cardiovascular diseases and/or pulmonary diseases such as symptomatic unstable, steroid-dependent asthma, and/or those who are receiving cardiovascular drugs such as beta-blockers, may be at higher risk for severe adverse reactions. Antihistamines can significantly inhibit the immediate skin test reactions. If long acting antihistamines have been taken recently, it is recommended that they should be stopped for the following minimum intervals before skin testing is performed: 1 week for hydroxyzine or cetirizine; 4 to 7 days for loratadine; 3 to 4 days for fexofenadine; and 24 to 48 hours for other sustained release antihistamines. Long term studies with allergenic extracts have not been conducted in animals to determine their potential for carcinogenesis, mutagenesis, or impairment of fertility. 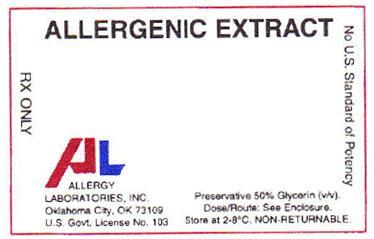 Animal reproduction studies have not been conducted with allergenic extracts. It is also not known whether allergenic extracts can cause fetal harm when administered to a pregnant woman or if they can affect reproduction capacity. The physician must weigh the benefits of immunotherapy against the risk of anaphylactic reactions that could result in harm to the mother and/or fetus. Hyposensitization should be used during pregnancy only if clearly necessary and administered cautiously. It is not known if allergenic extracts appear in human milk. Because many drugs are excreted in human milk, caution should be exercised when allergenic extracts are administered to a nursing woman. Extracts have not been studied in children, so the safety in children has not been established. Doses of allergenic extracts for children are generally the same as those for adults. In the case of large doses, the amount of extract given to a child may be modified so that the discomfort of the injection is minimized. (1) Local Reactions - A mild burning immediately after the injection is to be expected; this usually subsides in 10 to 20 seconds. Reactions at the site of injection (erythema, swelling, pruritus) may be immediate or delayed. Immediate wheal and erythema reactions are ordinarily of little consequence; but if very large, may be the first manifestation of a systemic reaction. Delayed reactions start several hours after injection with local edema, erythema, itching or pain. The reactions are most apparent 24 hours after injection and usually require no treatment. Antihistamines may be administered orally if necessary. Large local reactions may be treated by local applications of cold, wet dressings and/or the use of oral antihistamines. These reactions should be considered a warning of possible severe systemic reaction and need for temporarily reduced dosage. In such cases the next therapeutic dose should be reduced to the last dose which did not elicit a reaction and subsequent doses increased more slowly. (2) Systemic Reactions - Most severe systemic reactions occur within 30 minutes of injection but may occur at anytime subsequent to treatment. Symptoms may range from mild to life-threatening (due to anaphylaxis). Systemic reactions are characterized by one or more of the following symptoms: sneezing, mild to severe generalized urticaria, itching other than at the injection site, extensive or generalized edema, wheezing, asthma, dyspnea, cyanosis, tachycardia, lacrimation, marked perspiration, cough, hypotension, syncope and upper airway obstruction. Symptoms may progress to anaphylactic shock and death. If a systemic or anaphylactic reaction does occur, apply a tourniquet above the site of injection and inject 1:1,000 epinephrine-hydrochloride intramuscularly into the opposite arm or gluteal area. Loosen the tourniquet at least every 10 minutes. Do not obstruct arterial blood flow with the tourniquet. ADULT: 0.3 mL to 0.5 mL should be injected intramuscularly or subcutaneously. Repeat in 5 to 10 minutes if necessary. PEDIATRIC: Suggested dosage for infants to 2 years of age is 0.05 mL to 0.1 mL; for children 2 to 6 years, 0.15 mL; and children 6 to 12 years, 0.2 mL. Doses may be repeated every 20 minutes, depending on the severity of the condition and the response of the patient. After administration of epinephrine, profound shock or vasomotor collapse should be treated with intravenous fluids, and vasoactive drugs if necessary. An open airway should be insured. Give oxygen by mask. Intravenous antihistamine, inhaled bronchodilators, theophyllin and/or adrenal corticosteroids may be used if necessary after adequate epinephrine and circulatory support has been given. Emergency resuscitation measures and personnel trained in their use must be available immediately in the event of a serious systemic or anaphylactic reaction not responsive to the above measures. If the patient is continued on immunotherapy, a decrease of at least 50% in the next dose should follow serious systemic reactions. Increases in dose should be made cautiously. Repeated systemic reactions are sufficient reason for discontinuation of increased dosages. (3) To report suspected ADVERSE REACTIONS, contact Allergy Laboratories, Inc. 800-654-3971 or FDA 800-FDA-1088 or www.fda/gov/medwatch. Signs and symptoms of overdose are typically local and systemic reactions. For a description and management of overdose reactions, see ADVERSE REACTIONS. Allergenic extracts may be administered for diagnostic testing or therapeutic purposes. The dosage will depend on the particular use of the extract. General: When used for diagnostic testing to determine a patientâ€™s sensitivity to specific antigens and aid in the diagnosis and treatment of atopic disease, the recommended procedure is to initially perform puncture tests, then follow with intradermal tests. The number of skin tests applied at one time will depend on the particular patient and their allergic history. These tests should be performed and observed in 15 to 20 minutes. Additional tests may be applied in sequence. Perform tests on the anterolateral aspect of the upper arm on an area that permits the effective application of a tourniquet proximal to the site of the test. The skin at the site of injection should be disinfected with rubbing alcohol before testing. A positive reaction usually develops in 15 to 20 minutes. The positive response is a wheal and flare reaction that is larger than the negative control and evaluated based on the size of the reaction. Controls: A negative control containing the same solution that the extract was prepared in should be applied to a test site in the same manner as the tests being performed. Histamine phosphate should be used as a positive control for evaluation of skin testing. Refer to manufacturers directions provided with Histamine phosphate for recommended dosage and administration. Percutaneous testing: In general, skin is scratched, punctured or pricked just before the allergen is applied or through a drop of test allergen which is placed on the skin. There are several devices available for this technique. Refer to the device manufacturers instructions for proper use. Test areas should be no closer than 4-5 cm apart to avoid the interference of multiple reactions. Clean test areas with alcohol and air dry. Place the allergen on the volar surface of the patientâ€™s forearm, upper arm, or back. 1. For puncture tests, apply one drop of extract to the skin. Pierce the drop of extract and skin using a sterile hypodermic needle or vaccinating needle. Maintain the needle perpendicular to the skin surface and rock the needle back and forth to produce a small hole without bleeding. Do not rotate or gouge the needle. Remove needle from skin and wipe excess extract from skin surface. 2. For scratch tests using a scarifier or needle: make a scratch 1/16 inch long on the epidermis penetrating the outer cornified area but being careful not to draw blood. Apply one drop of allergen to the scratch or puncture. Intracutaneous (Intradermal) testing: If puncture test is negative, proceed with intradermal test. Intradermal tests should not be performed if puncture test is positive. Use a separate sterile syringe (tuberculin type equipped with a 27 gauge by 3/8 inch needle with intradermal bevel) for each antigen. To administer the test, inject 0.02 mL of allergen into the epidermis using dilutions of the concentrated extract; a 1:500 v/v dilution for foods and 1:1,000 v/v dilution for other extracts. If the test has been performed properly, the solution should raise a bleb 2 to 3 mm in diameter. If the bleb does not appear, the injection was made too deeply. To prepare intradermal testing strengths using 1:20 w/v bulk concentrates, use the following example: Add 1 mL of 1:20 w/v to 4 mL diluent to make a 1:100 v/v dilution. Add 1 mL of 1:100 v/v to 4 mL diluent to make a 1:500 v/v dilution. Add 0.5 mL of 1:100 v/v dilution to 4.5 mL diluent to make a 1:1,000 v/v dilution. (1) General: Parenteral drug products should be inspected visually for particulate matter and discoloration prior to administration whenever solution and container permit. Injections are given subcutaneously; preferably in the arm. It is advantageous to give injections in alternate arms. Use sterile precautions and a tuberculin syringe when administering each dose. Allergen immunotherapy is typically initiated with a diluted formulation of allergens prescribed by a physician for administration to a patient. Doses are gradually increased over time and ultimately reach a maintenance dose where the patient is maintained for as long as the physician or patient feels is necessary. The formulation and dosage schedule is determined by the physician and is based on diagnostic testing and patient history. Patients with very high sensitivities should be initiated with lower concentrations (higher dilutions) and may need a very relaxed progression to maintenance doses. Pre-seasonal therapy may be initiated three months before seasonal difficulty begins and brought to maintenance dose and discontinued after that season ends. Perennial therapy (recommended) brings the patient up to tolerated maintenance dose where they remain until improvement of allergic symptoms occurs. Injections may be given at intervals of 4 to 7 days with either therapy. (2) Suggested dilution series: Concentrated Allergenic Extracts must be diluted with Sterile Diluent for Allergenic Extract before using for immunotherapy. A 1:100,000 v/v dilution of concentrate is usually satisfactory to start treatment. To prepare a 10-fold dilution series from concentrated bulk extract, the following is suggested: Add 1 mL of 1:20 w/v extract to 4 mL diluent to make a 1:100 v/v dilution. Add 0.5 mL of the 1:100 dilution to 4.5 mL of diluent to make a 1:1,000 v/v dilution. Add 0.5 mL of the 1:1,1000 dilution to 4.5 mL diluent to make a 1:10,000 v/v dilution. Add 0.5 mL of the 1:10,000 dilution to 4.5 mL of diluent to make a 1:100,000 v/v dilution. The series may be extended to 1:1,000,000 v/v by preparing one more similar dilution as a precaution for sensitive patients. (3) Maintenance: The maintenance level is the largest dose tolerated by the patient that relieves symptoms without producing undesirable local or general reactions. After immunotherapy has been established, a maintenance dose should be given at weekly intervals. The interval between maintenance doses can be increased gradually from one week to 10 days, to 2 weeks, 3 weeks, or even 4 weeks as allergy symptoms allow. Repeat maintenance doses at a given interval three or four times to check for continued allergy symptom relief before increasing the interval further. If large local (or systemic) reactions occur at one interval, do not increase the interval. Protection is lost rapidly if the interval between doses is more than 4 weeks. It may not be possible for all patients to reach the maximum dose indicated on the suggested dosage schedule. (4) Suggested dosage schedule: Because the degree of sensitivity varies in many individuals, the dose and interval may need adjustment and should reflect the patientâ€™s tolerance and response. A dose should never be given until all reactions resulting from a previous dose have entirely disappeared. After a period on immunotherapy, better tolerance may permit a longer interval between injections, or a larger maintenance dose, or both. 2 0.04 9 0.05 14 0.05 20 0.05 Continue 0.25 mL of 1:100 v/v weekly. (5) Dose adjustments: Since the individual components of the extract are those to which the patient is allergic and to which he will be exposed, typical allergic symptoms may follow shortly after the injection, particularly those experienced by the patient during exposure when the antigen from the environment plus the injected antigen exceeds the patientâ€™s tolerance to the antigen. In such cases, decrease the size of the next scheduled dose by at least one-half of the previous dose. (6) Administration: Use aseptic precautions when diluting and/or preparing an injection. To avoid cross-contamination, do not use the same needle to withdraw materials from multiple vials. Use a sterile tuberculin syringe (26 or 27 gauge) with a needle at least 5/8â€ long and graduated in 0.01 mL units to measure each dose. Bulk extract (stock concentrate) in 50% v/v glycerin is supplied in 10 mL, 30 mL, and 50 mL multiple dose vials as well as 2 mL scratch (dropper) vials. Intradermal tests are supplied in 5 mL vials at 1:500 v/v for food extracts and at 1:1,000 v/v for other extracts. To insure the maximum potency of bulk extract and extract dilutions, it is recommended that they be maintained at a temperature of 2 to 8 degrees Celsius. Do not freeze. Do not use after the expiration date shown on the vial label. Norman, P.S. : In vivo methods of study of allergy: Skin and Mucosal tests, techniques, and interpretation. In Middleton, E. Jr., Reed, C. E. and Ellis, E.F. (ed): Allergy Principles and Practice, (Vol. 1), p. 258. St. Louis, The C.V. Mosby Co. 1978.